Anthony Duclair and his award show had Wednesday off which one supposes the other prospects of the New York Islanders and New York Rangers appreciated since we had 5 games on Wednesday evening. 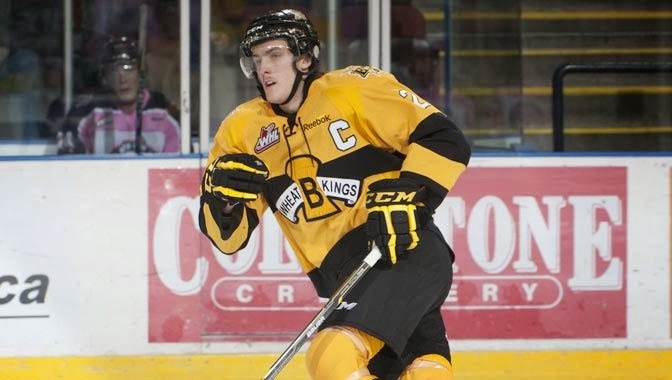 The biggest game was in Red Deer Alberta where Ryan Pulock (NYI 2013 1st) and his Brandon Wheat Kings were taking on the Red Deer Rebels. At stake was 1st place in the WHL's Central Division and the 2nd seed overall in the WHL's Eastern Conference standings as the Wheat Kings, the Regina Pats and the Swift Current Broncos were separated by 3 points. Pulock played well notching a goal and an assist but the Wheat Kings lost via the shootout 4-3. The Wheat Kings kept having to play from behind in this game as they never led and Red Deer would have 1 goal leads on 3 separate occasions. With Red Deer already up 1-0, it was Pulock setting up Rihards Bukarts to tie the game at 1-1 at the 6:43 mark of the first period. In the 3rd period with Brandon now down 2-1, it was Pulock scoring himself with a power play goal at 3:15 of the period to tie the game up at 2-2. For Pulock the 1-1-2 improved his stats to 16-28-44 as he extended his scoring streak to 7 games (3-8-11). Brandon came away with a point and thanks to the tiebreaker was able to reclaim 1st place in the WHL's Central Division as Swift Current who was idle fell to 6th and Regina 7th in the standings. That 2nd seed in the Eastern Conference could mean the difference between having home ice in the WHL playoffs or being a bottom seed. Adam Tambellini (NYR 2013 3rd) and his Calgary Hitmen had a chance to make up some ground in their race for the 1st seed in the WHL's Eastern Conference but ran into a very hot Tri-City American team. Tri-City shut down the Calgary attack as they lost to the Americans 4-1. Tri-City exploded for 4 third period goals in earning the win as Tambellini was scoreless and a -1 for the game. Calgary who trails Edmonton by 3 points in the WHL's Eastern Conference standings failed to gain any ground but also gave Edmonton a game in hand for which they can use to extend their lead in the standings. Loic Leduc (NYI 2012 4th) and his Rimouski Oceanic also missed out on a chance to make up some ground in the QMJHL standings as they lost to the Blainville-Boisbriand Armada 5-2. Leduc had a mixed bag of a game as he was caught on for 2 goals against, took a tripping minor but was credited with 3 hits. Jesse Grahman (NYI 2012 6th) and his Saginaw Spirit gave up 4 goals in the first period and never recovered as they lost to the Sault Ste. Marie Greyhounds 6-3. Graham was scoreless with a cross checking minor. Mackenzie Skapski (NYR 2012 6th) was the backup as his Kootenay Ice were spanked on the road by the Medicine Hat Tigers 6-2. Kootenay missed out on a chance to move up to 7th in the WHL's Eastern Conference Standings by using 1 of their games in hand.